Twelve tornadoes ripped through parts of North Texas the day after Christmas. The storms on Dec. 26 ultimately killed 13 people and damaged or destroyed hundreds of homes. 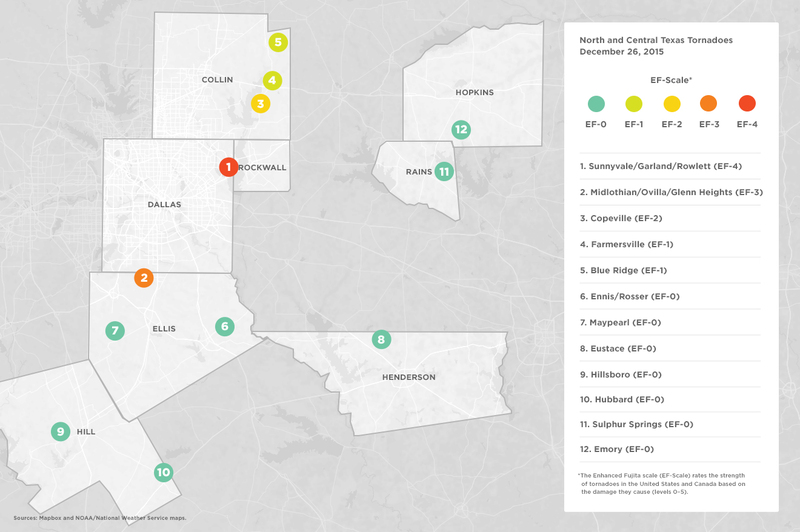 Four North Texas counties were declared disaster areas. Eight people were killed in automobile accidents in Garland at Interstate 30 and President George Bush Turnpike. Some of the cars appear to have been thrown from the highways and onto the ground, Garland police initially said. North of Garland, in Collin County, three people died, including an infant. 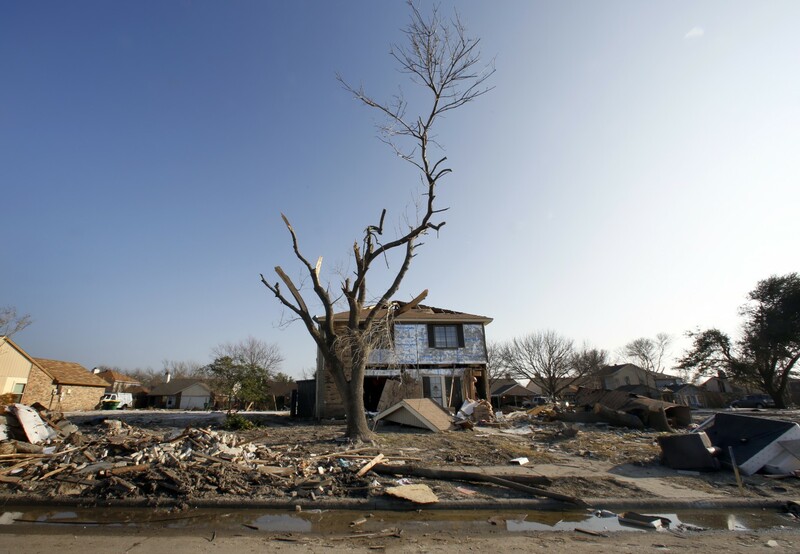 An EF4 tornado – the biggest of the 12 – raced through Garland, with winds of up to 200 mph. 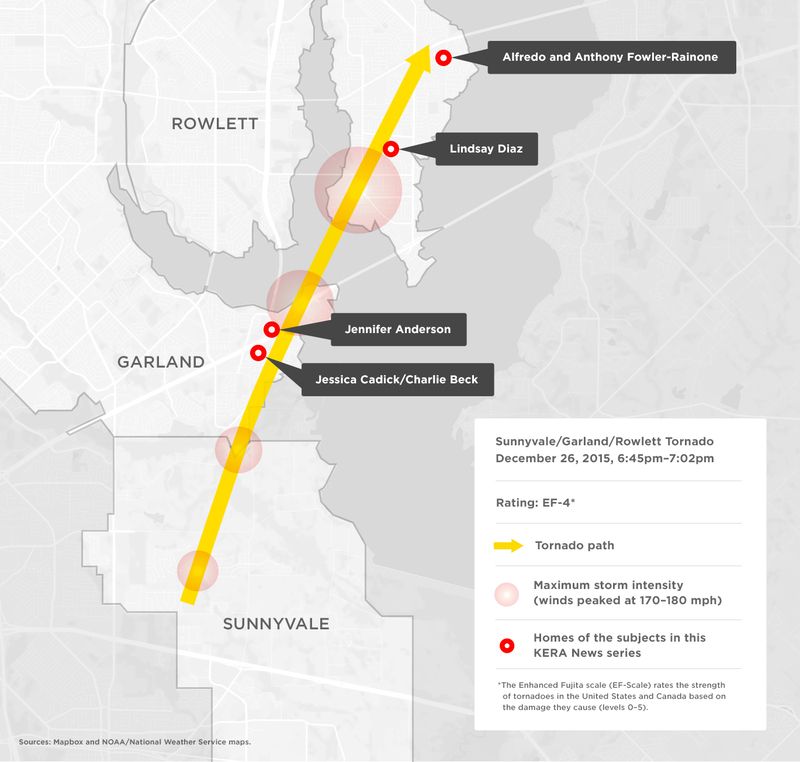 The tornado traveled 13 miles, also hitting Sunnyvale and Rowlett. Two tornadoes were confirmed in Collin County, including an EF2 tornado near Copeville and an EF1 tornado near Blue Ridge. Later, weather service crews determined an EF3 tornado hit northern Ellis County. After the tornadoes came the deluge. By Sunday, Dec. 27, precipitation had topped 60 inches for the year at Dallas-Fort Worth International Airport, a first for North Texas, the National Weather Service said. Cleanup would take weeks — rebuilding will take months, if not years. Here’s who you will meet throughout March in the KERA series One Crisis Away: Rebuilding A Life. The tornadoes affected these four families in many ways — financially, physically and emotionally. Alfredo and Anthony Fowler-Rainone took shelter in the laundry room of their Rowlett home. They hugged their three dogs as a tornado rolled through their neighborhood. Because their home value recently increased, they’re underinsured by about $20,000. Both men are HIV positive and on disability. They don’t have much of a savings account, but they’re determined to rebuild. Jennifer Anderson took her 4- and 6-year-old boys to visit family in Mississippi for Christmas. She came home to a apartment demolished by a tornado. Keepsakes were smashed and furniture was ruined. Anderson has renter’s insurance, but her policy is only worth $10,000 — and it won’t cover all her losses. Anderson has seen tragedy before; she moved to Texas two-and-a-half years ago after her husband’s suicide. Learn more about Anderson. Lindsay Diaz owns a duplex and was living with her boyfriend, Aris, and their 6-month-old baby Arian in Rowlett when the storms hit. They all jumped in the bathtub, which lifted off the ground and slammed back down as the tornado barreled past. Diaz’s house was destroyed and she’s underinsured. If she wants to rebuild, she’s going to have to come up with several thousand dollars — money she doesn’t have. Jessica Cadick and Charles Beck are engaged and were renting a place in Garland, without renters insurance, when a tornado ripped their house apart. Cadick has a steady job at Eastfield College. Beck’s a general contractor. To save money, they weren’t carrying full coverage on his work truck, which was destroyed. Beck has actually been hired to help rebuild his wrecked house. They have three kids, all under 10 years old. These are just four stories amid hundreds of North Texans trying to regain their financial footing after the storm. Edward Smith, chaplain with Victim Relief Ministries, says it’s a long road.